Easily pack your electronics cords and other knick knacks with this stylish travel roll. Luggage shifts, cords tangle, but you can keep your electronic companions organized in style with this travel roll. 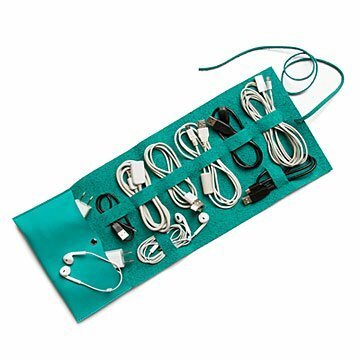 No more untangling a messy handful of cords just to charge your phone, rather, neatly tuck up to eight cords and two plugs into your stylish organizer. It's also great for stowing small knick-knacks like watches, hair clips, or other on-the-go necessities. Designed in Los Angeles. Made in China. She has not received the gift yet. Her birthday is next week. It's perfect for my wife who travels a lot. Fits well inside pocket of traveling bag and readily accessible.. This product is great because it is compact and keeps everything organized! Great gift for my dad, who travels so much! He loved this - simple, easy to use, and well-made. Haven't used it yet, but will soon! Only good thing about it is the nice keather. It consists of just a few slits for cords and when stocked becomes too bulky to roll up properly. Not anything I would ever want again and am considering returning. It would have been perfect if so,e of the slits were larger. The only cords that would fit were the 3 foot ones. Looked bigger in the picture.